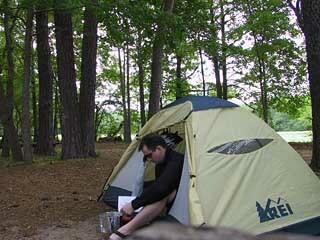 I woke up this morning in the Jamestown Campground and started packing up my camp. Everything still feels a little awkward, as I haven't really developed a system yet for packing up and getting going yet. I'm still learning what works well and what doesn't, and I've already made some changes in the way I pack things on my bike. Until now, putting all my stuff in and out of back right pannier was like putting together a jigsaw puzzle. I've decided I don't want to deal with that every morning, so I've moved the tent from inside the bag to atop the back rack. Today's ride took me 45.2 miles from the campground to a Methodist Church near Glendale. 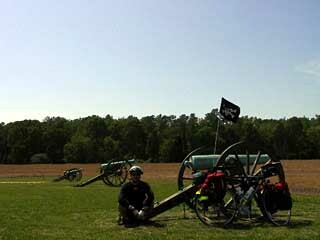 The route took me past four plantations from the seventeenth and eighteenth century, then past the site of the Battle of Malvern Hill where over 5,000 Confederate soldiers died while attempting to charge into the face of withering Union cannon fire. Shortly after passing the battlefield I came to the Willis Methodist Church, my home for the night. I was met in the churchyard by Myrt Harrell, wife of Pastor Manning Harrell. We talked for a short while about their life and the cyclists that passed through and then Manning came out and joined us. After a little more conversation I started setting up my tent in a back corner of the churchyard. Around 5:00 another cyclist pulled up. The first words he said to me were "Hi, I'm Ed Gibbs from Tennessee. I'm having a midlife crisis." Ed had a very easygoing and outgoing personality and after eating dinner we agreed to ride together for a day or so. The Pastor graciously let me use a power outlet in a shed behind the church, and I spent a few hours charging my batteries, responding to email, and updating this web page. Around midnight I crawled back into my tent and finally went to sleep. Hey, nice REI tent! Not a bad looking cannon, either. Aren't you glad that isn't in your panniers? When I go whole-hog with touring gear, I put BOTH the tent and sleeping bag on the top of the rack. (That way, you'll have room for a desktop as well as the laptop.) I line the stuff sack with a plastic garbage bag, and voila! no wet sleeping bags. I'm following your trip with great (but sadly, vicarious) enthusiasm! yeah, yeah..... But are you enjoying yourself Nick? And don't give me a technical answer, a simple "yes" or "no" will do. Heck yeah, Audrey, I'm having the time of my life! I think by following your tales on this journey I will learn more about American History than I did in High School...like that's really a challenge though.